Given the increasing importance of the role played by small and medium‐sized enterprises (SMEs) within the developing economy, this paper intends to provide further insight into corporate social responsibility (CSR) practices among SMEs. Within this context, the purpose is to propose the role of non-audit services (NAS), which contribute to the possible explanation of the SME adoption of CSR practices. A conceptual approach is taken whereby this paper is based on an extensive literature review of NAS and CSR practices in the SME context. Then, based on the knowledge-based view (KBV), this paper set to explain and highlight the role of NAS play to enhance CSR practices among SMEs. This paper provides a theoretical discussion on the importance of CSR in ensuring the survival of the SMEs. Although the proposition of NAS is relatively new, it provides an interesting and remarkable avenue for further research especially in the developing country. Overall, this paper draws attention to the importance of NAS in enhancing the survival and performance of the SMEs. SMEs are believed to be of significantly different from the larger business organisations. The characteristic or cultural aspect of the SMEs are not the same as the large companies (Lepoutre & Heene, 2006). Apart from that, the findings from larger companies do not really reflect the SMEs’ environment (Jenkins, 2004; Spence, 2007). For instance, SMEs are usually having fewer resources, governs through informal organisational structures, emphasis on survival (Parker, et al., 2009) and less likely to engaged in CSR activities (Spence, 2007), as compared to larger companies. However, it is perceived that SMEs are in a better position and comparatively well equipped to design appropriate CSR strategies to address the needs of the local communities as they operate “on the ground”, they are more aware of the local environmental risks and emerging social issues than their larger counterparts (Sweeney, 2007). Generally, SMEs have a greater understanding of the local cultural and political contexts, more partnering and links to local civil society and greater commitment to operating in a specific area (Baden, et al., 2011). Nowadays, CSR has been assumed to encompass philanthropic activities such as donation for individual or sponsorship for events. 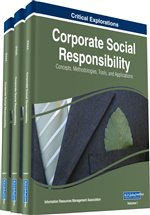 CSR has emerged into a border perspective, which include ethics and compliance, stakeholders’ elements (such as employees, environment, community, customer, shareholder, and supplier) and so on (Carroll, 1999; Crowther & Aras, 2008; Carroll & Shabana, 2010). This highlights the importance and timeliness of CSR practices research among SMEs to be undertaken.